It's pretty easy to get most PHP/MySQL applications working with nginx, but this requires a FastCGI implementation of PHP, and I've chosen PHP-FPM for this walk-through. As of April 23, 2018, this guide has been updated for OpenBSD 6.3. It was tested on the amd64 architecture, but will likely work on i386 and perhaps others. First, install OpenBSD. Be sure to create a user-level account for yourself during the installation process, and I'd recommend disabling remote root logins while you're at it. This user account will be added to the wheel group. On BSD systems, wheel group is comparable to an administrator group, granting access to use the su command, etc. You can add other trusted users to this group later on. OpenBSD no longer includes sudo in the base install. It's still in ports if you must use it, but we'll be making use of the replacement doas(1) tool, which is similar to sudo in several ways. Create a file called /etc/doas.conf. The man pages for doas and doas.conf are quite helpful, but as a quick and dirty way to get up and running with doas, there's a minimal doas.conf file below. You can also add "nopass" after "permit" if you don't want to be prompted for a password. I don't recommend doing that to a production environment. If you have a hard time with typing "sudo" instead of "doas", you might want to add an alias to your shell profile. You will be prompted for which version of PHP you want to install. Unless you have a good reason not to, it's best to go with the newest (highest version number) available. 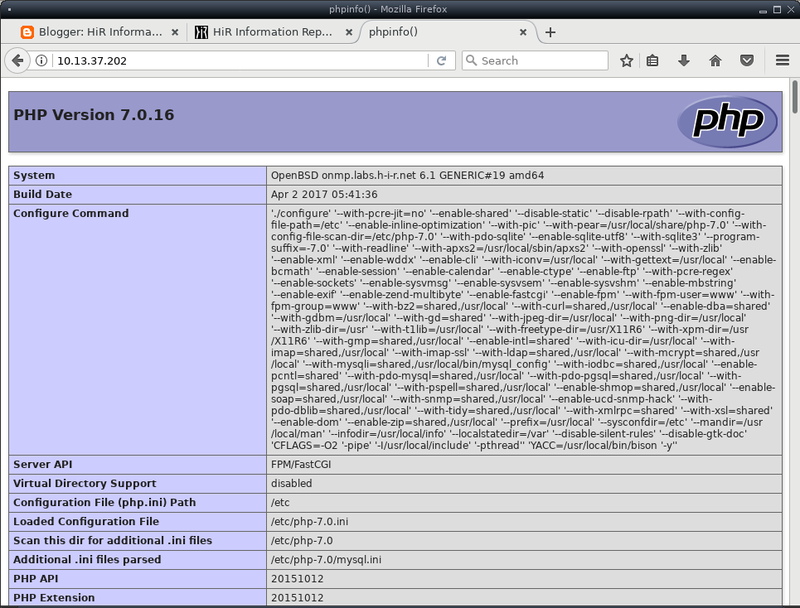 In OpenBSD 6.3, that's PHP 7.0.28. Enable php-mysqli by symlinking the sample mysqli.ini to the /etc/php-7.0 directory. Follow the prompts and choose a good password for the root user while you're at it. Next, edit /etc/nginx/nginx.conf and add "index.php" to the line that has the other index files. The config block should look like this, but you can alter the order if you wish. Uncomment the following block of configuration to enable nginx to forward PHP requests to php-fpm. Nginx makes it relatively easy to set up multiple virtual hosts, but that's beyond the scope of this article. We'll install everything to /var/www/htdocs as the default web root. In /etc/php-fpm.conf, I would suggest increasing the value of pm.max_children to something higher than the default of 5, as even in my testing environment, this was insufficient. I went with 25. It seems to be working well in my production web server environments. You can manually start all these services (mysqld is already running because we started it earlier), or just reboot to make sure everything works. Since the web environment is in a chroot restricted to /var/www and the MySQL socket is not inside /var/www, the easiest way to get database access is to create your MySQL users for a host of "127.0.0.1" instead of localhost. This forces MySQL connections over TCP. There are some complicated ways of getting the socket into /var/www, such as forcing MySQL to write it inside /var/www or creating hard links to the socket. Those are beyond the scope of this article. My first test, as usual, was a simple PHPInfo file saved as index.php. I've managed to install various pre-packaged content management systems on OpenBSD's with nginx without any problems. Some apps (like OwnCloud) seem to require some extra work.